A 26-year-old hacker just banked millions to take on Elon Musk. George Hotz is the founder of Comma.ai, an autonomous driving startup that's roughly six months old. On Monday, top VC firm Andreessen Horowitz announced a $3.1 million investment in the company. Comma.ai is working on a kit that will make it possible to turn regular vehicles into semi-autonomous ones. In October, Hotz purchased a 2016 Acura ILX, cameras and GoPro mounts and started developing the technology out of his San Francisco garage. The goal is to bring the kit -- both computer vision software and the cameras -- to market for less than $1,000 a pop before the end of 2016. It'll be relatively easy to install, said Hotz, "on par with setting up a piece of IKEA furniture." Hotz, who Dixon describes as "brilliant," has made quite a dent in Silicon Valley over the past decade. When he was 17, he discovered a way to hack the iPhone so that all carriers could use the device, not just AT&T (the only carrier to initially have a contract). His alias, Geohot, became legendary in hacker circles. He went to Rochester Institute of Technology but dropped out after one semester. He interned at Google (GOOG), worked at Facebook (FB), and was sued by Sony over a Playstation 3 hack. He took computer science courses at Carnegie Mellon but didn't earn a bachelor's degree. "I think college is potentially the greatest scam in history," he told CNNMoney on Monday. Hotz, who is originally from New Jersey, said he's long been fascinated with artificial intelligence but wasn't quite sure how to approach it. "For awhile, I thought it was going to be incredibly difficult to contribute," he said. In January 2015, he started working as a researcher at Vicarious, a company that's building artificial intelligence algorithms. "I started reading all the papers. I thought, 'This stuff isn't that hard. This isn't ultra sophisticated. This is basic,'" he said. Moreover, "the mistakes people are making are basic." In July 2015, Hotz quit Vicarious in the hopes of striking up a deal with Musk himself. And it wasn't just a pipe dream. 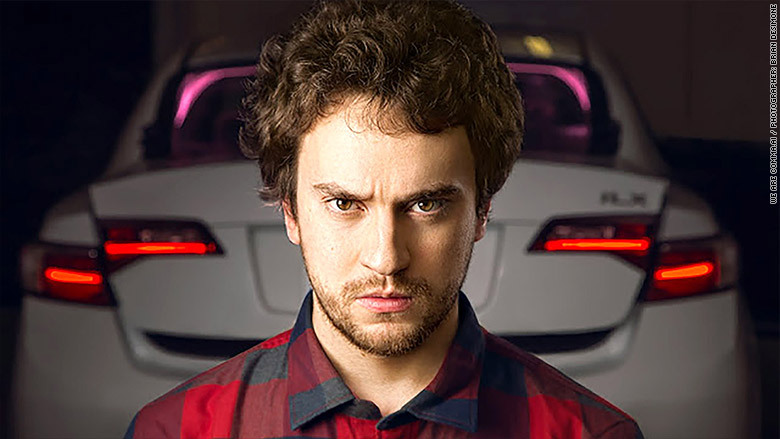 Hotz met Musk and proposed a new kind of computer vision system for Tesla. But after three months of conversation, the contract talks ultimately fizzled. Hotz said it was because Musk wanted to be able to pass on Hotz's tech even if he met all the contract's requirements. Tesla did not immediately respond to request for comment. That's when Hotz decided to go at it himself. "I started to look around at the other players. These people are noobs," he said. In particular, Hotz feels that General Motors (GM) got ripped off in its $1 billion acquisition of startup Cruise Automation, an autonomous driving kit that has yet to ship. "That's an insane acquisition price for a company that has technology that questionably works," said Hotz. Andreessen Horowitz's investment is the first venture capital funding that Comma.ai has raised. To date, the longest stretch his technology has successfully navigated is a one-hour ride from Mountain View to San Francisco. Hotz's team is small -- just four people -- but he's hiring. He said he gets about 100 applications a day from interested candidates.